Rollin’ Relics Help the Carousel Go ‘Round! 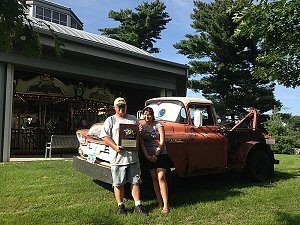 Thank you to the Des Moines Rollin’ Relics for their unwavering support of the Heritage Carousel! 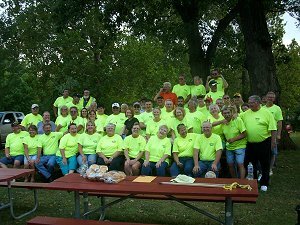 The 2018 Cruise to the Carousel, held on Sunday, August 26, 2018 was a huge success and a fun filled day for all. This is one of the longest running and largest car shows in Central Iowa! People come for the cars and stay for the fun. There were 183 cars registered for the August 26th show. This year there were 100 hot dogs, 100 walking tacos, and over 250 hamburgers served as well as tons of baked goods. The Rollin’ Relics handed out 53 awards including the Carousel Award. 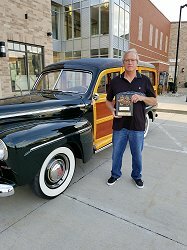 This year’s Carousel Award was given to Dean Archer of Ankeny for his 1946 Super Deluxe Ford Station Wagon. The car invokes the spirit of the Carousel with its attention to detail and shiny paint! This was Dean’s first year at the Cruise and he plans to come back next year. 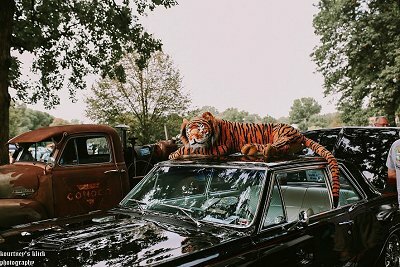 In addition to the cars and the food, some super items were auctioned off including a one of a kind commemorative Carousel T-Shirt quilt and a Weber grill. The 50/50 auction raised over $1,000 with half of it going to the Carousel. The event this year raised $7,000 for the Heritage Carousel. The Rollin’ Relics presented a check to Carousel board members on Oct. 1 at their monthly meeting. In addition, the Carousel was presented with a beautiful metal sign painted by Rich Hansen and Tim and Pat Schmidt from Maaco of Clive. It will receive a place of prominence on the new display case at the Carousel in 2019! The Heritage Carousel is operated by the Des Moines Carousel Foundation, a 501 C 3 not for profit. To view more photos from this event, click here! The August 27, 2017 Cruise to the Carousel has rolled on through! Once again, the Rollin’ Relics Car Club put on a great event. Cruise to the Carousel is the main fundraising event for the not-for-profit Heritage Carousel and we would not be able to keep goin’ round without the support of generous organizations like the Rollin’ Relcis! There were nearly 180 cars entered in the show, tons of prizes to win, great food, and lots of friends and laughter! The Rollin’ Relics sponsored free rides at the Carousel and we had over 900 Carousel riders throughout the day. 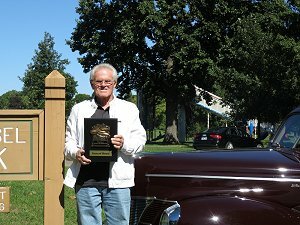 The awards were presented in the afternoon and the winner of the Carousel Choice Award was Bob Miller’s 1965 GTO. This car, like the Carousel, is a serious piece of machinery with a lot of whimsy! 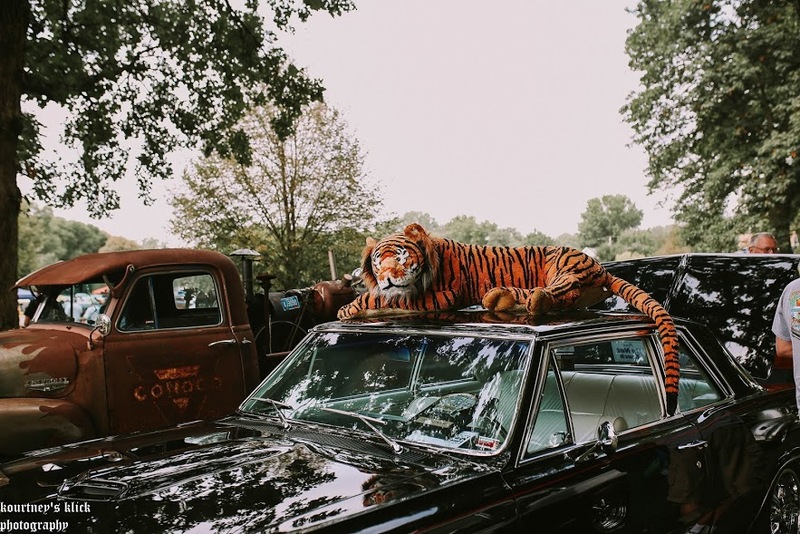 The tiger on top looks just like our Carousel Tiger, Trixie. Congratulations, Bob, and we hope to see you and everyone else back next year. The Rollin Relics sponsored the 16th annual Cruise to the Carousel on Sunday, August 28. It was another great success! There were 186 cars registered for the Car Show. Estimates put the crowd at 700 to 800. Guests were able to look at all the cars, bid on silent auction items, sign up for door prizes, enjoy food and drink and, as always, enjoy a free ride on the Carousel! The Carousel had nearly 1,000 riders during the event. The winner of the coveted Carousel Choice Award was Gene Poore. Gene’s car is a 1940 Ford Sedan. The winner of the Union Park Neighborhood Association award was a beautiful 1941 Oldsmobile owned by Chuck Clark. To see more pictures from the show, check out the Rollin Relics facebook page, rollinrelicsdsm. Cruise to the Carousel is a fun event for the community but it is also very important to the Carousel. It is the largest fundraiser for the Carousel each year. This year, members of the Rollin Relics presented the Heritage Carousel with a check for $7,000.00. Support from donors like the Rollin Relics allows us to maintain and update the Carousel while keeping the cost of a ride to 50 cents for children. For more information about donating to the Carousel, click here. 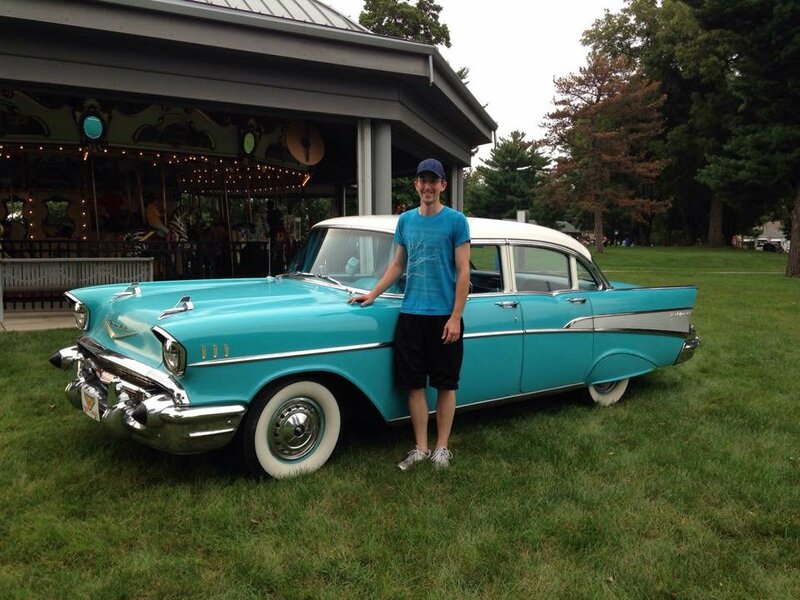 Carousel Choice winner Chad Davis and his '57 Chevy Bel Air! It was the Cruise to the Carousel's 15th year!! It was a banner year with a record breaking 220 cars registered and 986 free rides given! It was a lovely day for all in the park. Great food, amazing cars, smiles, and Carousel rides for everyone! The Cruise to the Carousel Car Show is put on by a lot of hard work, love, and dedication by the many volunteers from The Rollin' Relics Car Club. They put in a lot of work all year 'round to make this wonderful event happen and to help support The Heritage Carousel. We can't thank them enough! Many thanks to everyone who supported the show by organizing, entering, attending, and/or donating to the event. The Rollin' Relics are the largest contributor to The Heritage Carousel and have generously donated over $46,000 in the past 15 years to help keep the Carousel going 'round and keep the rides at 50 cents for children. Carousel Choice Award, Gale Gregg!! 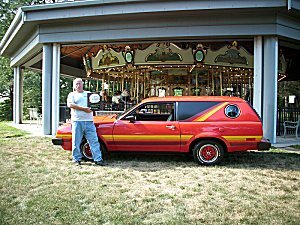 This year the Cruise to the Carousel Car Show had 160 registered cars as well as numerous cars in attendance from The Rollin Relics. It was a lovely day for all in the park! Great food, amazing cars, smiles and Carousel rides for everyone! The Rollin Relics sponsorship of the Carousel provided 1,100 FREE RIDES during the event. WOW! To view more photos from this year's event, click here. The Cruise to the Carousel Car Show is put on by a lot of hard work, love, and dedication by the many volunteers from The Rollin Relics Car Club. They put in a lot of work all year round to make this wonderful event happen and to help support The Heritage Carousel. We can't thank them enough! Many thanks to everyone who supported the show by organizing, entering, attending or donating to the event. The Rollin Relics is the largest annual contributor to The Heritage Carousel. They help to keep the Carousel going 'round and keep the rides at 50 cents for children. The Rollin’ Relics is the largest annual contributor to the Heritage Carousel! Click here for photos of this year’s show! a record breaking car show! Foundation Board Members, Scott Cahill, Rachele Kugel and Bobbi Segura. 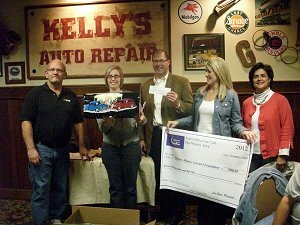 The 2012 Cruise to the Carousel had a record breaking show with 188 registered cars and the club gave a donation of $7,000 to the Des Moines Carousel Foundation in November. The car club has held the car show in Union Park for 12 years. The show continues to get better and more popular each year. Thank you to the many club members who organize, arrange for donations, coordinate cars, food and the schedule. It is a nearly year round effort of lots of hours, hard work and sweat that goes to support the Carousel, help the Foundation keep up on maintenance needs and help keep the price for a child’s ride at just 50¢. A custom, hand-painted mailbox was donated to the Carousel. The mailbox is a beautiful and fun depiction of cars at the Carousel. The fun and phenomenal artwork was done by Rich Hansen of Des Moines. Look for it to be on display at the Carousel in 2013! Mark your calendars for the 2013 Cruise to the Carousel – Sunday, August 25th. 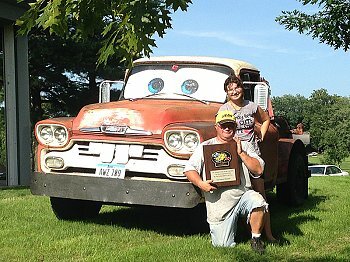 Rollin’ Relics Car Club Members – still having fun after a long, but successful, show! Thank you Rollin’ Relics Car Club for a Great Show! 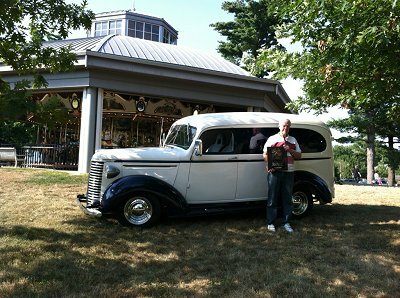 The 12th Annual “Cruise to the Carousel” took place Sun., August 26th and it was BIG! Over 180 beautiful cars were registered. Congratulations to Kent Gatzmeyer, recipient of the “Carousel Choice Award”! 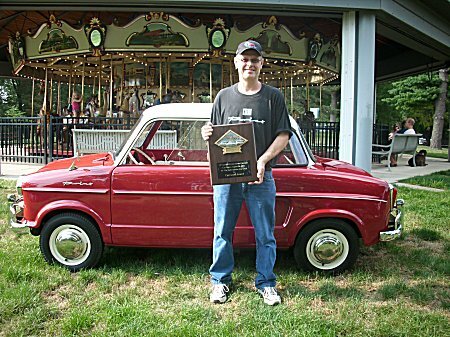 Kent, from Des Moines, is owner of a 1959 NSU Prinz II. Congratulations also to the Pilcher Family from Cummings, Iowa! Jacob and Isaac were two of the winners in the Model Car Contest, new to the Car Show this year. Isaac Pilcher was the Carousel Award Winner of the Model Car Division for his model “Moose’s Chop Shop”. Thanks for entering! donating to the event and/or attending. Over 1500 free Carousel rides were taken during the show! To view additional photos from this year’s event, click here! Check our Photo Gallery from past Cruise to the Carousel Car Show Events!